Find and organize Map content quickly when working with multiple Maps! The Map Navigator module consists of two independent functions. This is a very simple but useful function. As your map grows, it becomes harder to browse through it – you have many Topics extended and the Map may start to become difficult to manipulate and you have no readable complete view of the Map. You are constantly scrolling the map to reach the required Topic or collapse branches to get a clearer view of the Map. The Map Content feature does very simple thing – it shows the list of topics in a separate window in a tree format, allowing you to collapse/expand levels in that tree. The map itself remains in the current state and does not change unless you click a Topic in the Map Content window, the clicked Topic in the Map then becomes visible and selected. The Map Content window is dynamic. Once you change a Topic in the Map, it is immediately reflected in the Map Content window. If you modify a Topic in the Map Content window it will be immediately updated in the Map. If you switch to another Map (without closing the Map Content window), the Map Content window will be refreshed to show the content of the newly selected Map. 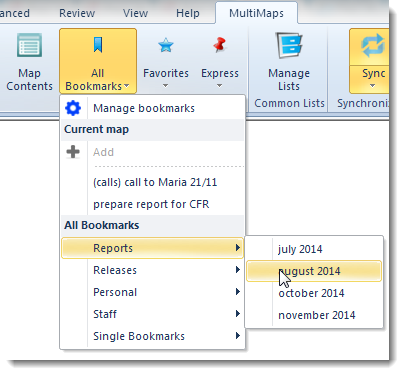 MultiMaps Bookmarks operate exactly the same as bookmarks in your favorite Web Browser, bookmarks in Word or Notepad and in any other program. 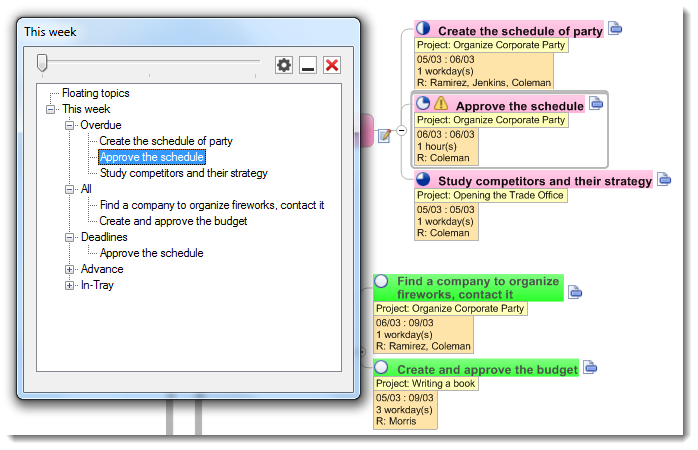 MindManager has a simple Bookmark function called Labels but they only work in the current Map. MultiMaps Bookmarks enables you to bookmark Topics in Maps in the same way as the Labels function does, however, MultiMaps Bookmarks can be accessed even if the map is not open. MultiMaps has its own Bookmarks database that stores bookmarks from different Maps. Just as you can in your Web Browser, you can organize Bookmarks into Folders. For example, a “Reports” folder can store bookmarks for Reports Topics from different project Maps. You don’t need to remember where this report is, and how to navigate to it through a Map. There is also a special bookmark group named Favorites. You can store the most often used bookmarks there. Just imagine how quickly you can now access your most required Topics! Multi-Maps for MindManager is available to purchase securely through our online store.